The Philippine Eagle (also known as the monkey-eating eagle) is one of the largest and most powerful eagles in the world; tragically, it is also one of the rarest and is critically endangered. It is now found only in the mountains of eastern Luzon in the north of the archipelago, and in the heavily forested areas of Mindanao. The breeding camp for these magnificent predators is sited at Malagos, in Calinan, near Davao City. 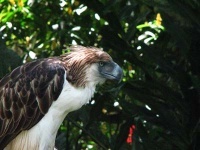 The Philippine Eagle Center is currently home to about 36 Philippine Eagles, half of which were bred in captivity. There are also ten other bird species and some mammals and reptiles living in a simulated tropical rainforest environment, mimicking their natural habitat. The centre is popular with tourists and allows them to see these rare and impressive creatures in their natural environment. There is an entrance charge, but guided tours of the centre are free; visitors are advised to call ahead and book in advance to avoid disappointment as the center sometimes hosts large school groups. Also at Malagos is an orchid farm, sanctuary of Philippine native orchids, which offers a restaurant and swimming pool as part of its facilities.